But the procedural motion simply to take up the Green New Deal failed to get a single vote. Democrats, including those who were sponsors of the resolution, denounced the move as a sham intended to divide their party and provide Republicans with election-season talking points. They overwhelmingly voted “present” on the motion, and it failed, 0-57. In the Senate, Chuck Schumer of New York, the Democratic leader, and Brian Schatz of Hawaii will announce a new special committee on climate change. The eight-person panel is expected to push to prioritize climate change in coming legislation on infrastructure and a deal to raise spending caps. “Mitch McConnell bet big that today’s vote would fracture the Democratic caucus,” said Varshini Prakash, the executive director of the Sunrise Movement, a youth movement for climate action. “Today he bet wrong,” she said. Shortly after the vote, however, Republican leaders including Mr. McConnell and Senator John Barrasso of Wyoming were scheduled to appear at a $500-a-plate fund-raiser for Senator Joni Ernst of Iowa at the National Mining Association, the chief lobbying group for the coal industry. Republicans meanwhile boasted that they exposed a plan so extreme that even Democrats shied away from it. “Democrats are trying to duck, dodge and distance themselves from a vote on their own Green New Deal. Every Democrat senator running for president supported it. Now when given the chance to actually go on the record, Democrats are desperate to avoid it,” Mr. Barrasso said. 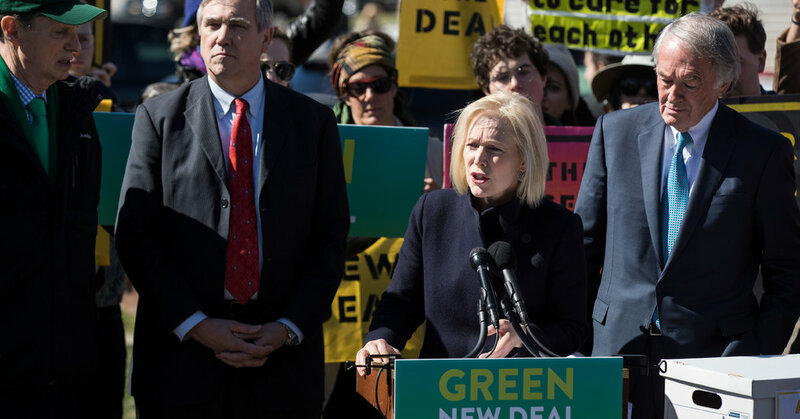 All six presidential candidates in the Senate — Cory Booker of New Jersey, Kirsten Gillibrand of New York, Kamala Harris of California, Amy Klobuchar of Minnesota, Bernie Sanders of Vermont and Elizabeth Warren of Massachusetts — had co-sponsored the Green New Deal.